Camp Onas is owned and operated by the Friends Camp Association of Pennsylvania, Inc. 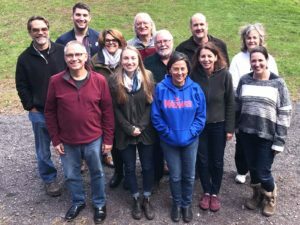 The Friends Camp Association of Pennsylvania is led by a Board of Directors who meet regularly throughout the year. The Board of Directors is made up primarily of a group of volunteers nominated by the Quaker Monthly Meetings of Bucks County Quarterly Meeting of the Religious Society of Friends, with some members recruited by the Board in “at-large” positions. The Board of Directors ensures that Camp Onas carries out its mission, and will be positioned to do so for years to come. They work closely with Holly and Matt to plan for Onas’s future, to plan and execute large-scale initiatives, and advise on large decisions.